Sanjay Kumar submitted photos of claims made by Aam Aadmi Party that he came across in newspapers or social media and requested us to Fact-Check them. On rigorous examinations, we have found the claims to be TRUE. Fact-Check Report: TRUE. However, whether this is the biggest boost ever to Higher Education is contestable. 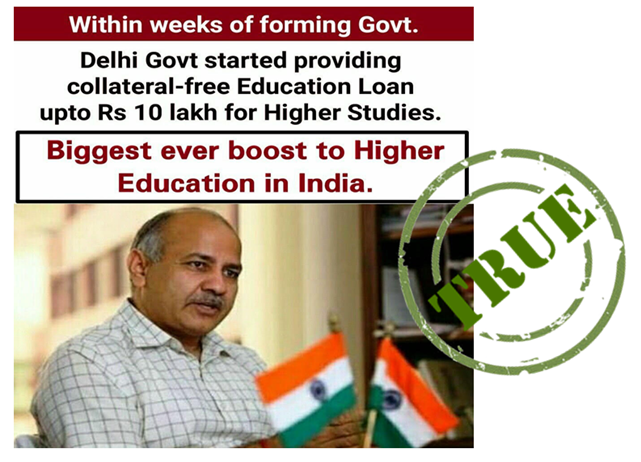 Government of Delhi launched Higher Education Guarantee Scheme that offers interest free loans to students on 9th September 2015. The scheme covers the 105 professional and academic courses run by accredited private institutions also. However, the students of Delhi University and other central institutions are not eligible under this since the overall fee of these institutions is already very low. According to the outcome budget document 2017-18, the government disbursed loans under this scheme to 131 students last year. However, it is difficult to establish that this is the biggest ever to Higher Education in India. In my limited knowledge of history of education, much bigger boosts have been given to Higher Education in India. Having said this, the claim about the collateral free education loan is completely true. The Delhi Cabinet chaired by Chief Minister Arvind Kejriwal in its meeting dated 3rd November 2015 approved the abolition of 200 affidavits being sought by various departments, local bodies and other organizations. The cabinet note urged the departments to trust the citizen and directed them to adopt self-declaration. 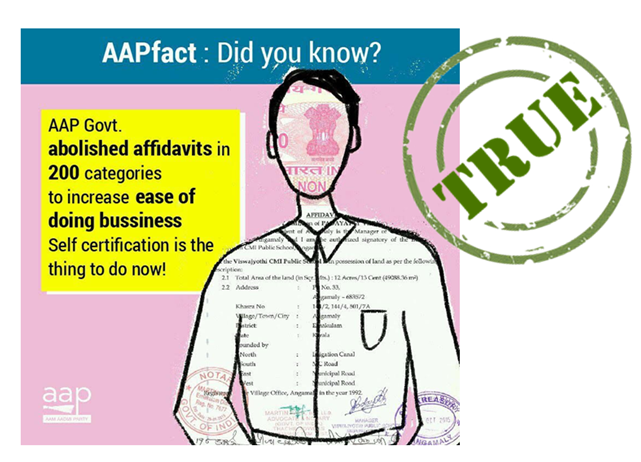 Though the claim has been found true, however it is not clear how that would affect ease of doing business since most affidavits relate to ration card, registration card, permits, license, pensions and scholarships. Only a small fraction of these 200 affidavits affect the ease of doing business, though they substantially make the lives of poor people easy. Here, the corruption is measured in terms of number of corruption related complaints received by Central Vigilance Commission (CVC), the anti-corruption body. CVC releases annual report detailing the statistics about the corruption related complaints related to several Ministries and departments. The latest report of 2016 has been tabled in Parliament but is yet to be uploaded on its website. Therefore, one can only reply upon the reportage of the issue by the media organizations. However, its 2015 is publically available on its website. 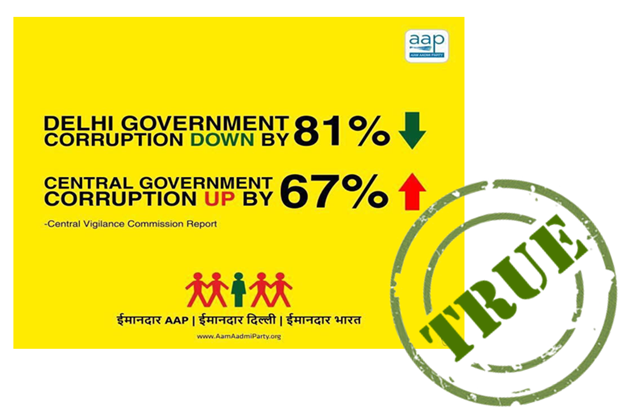 According to Business Standard reportage of the CVC report (and reiterated by several news organizations including Hindustan Times, India Today and Times of India), the number of complaints of corruption against Delhi government departments has come down from 5,139 in 2015 to 969 in 2016, a decrease of 81.2%. During the same time, the anti-corruption body received 49,847 complaints of corruption in 2016 compared to 29,838 in 2014, an increase of 67.1%. Therefore, the claims made in the photo are true. Claim #4: Daily wages increased and medicines freely available. I) The Delhi Cabinet on 25th February 2017 approved a 36% hike in minimum wages for unskilled, semi-skilled and skilled workers. In first week of March this year, the Lieutenant Governor gave his approval to the increase. As per the new policy, minimum wages for unskilled labour has increased from Rs 9,724 to Rs. 13,350. Wages for semi-skilled labour has been increased from Rs 10,764 to Rs 14,698 while those for skilled labour rose from Rs 11,830 to Rs 16,182. This decision makes Delhi the state to provide the highest minimum wages to the working class population. This is the second time Aam Aadmi Party led government increased the minimum wages. The claim about the wages has been found to be true. II) With regard to medicine availability in hospitals and Mohalla Clinics it is hard to establish or dispute the claim. Therefore we rely on newspaper reports, news channels stories, and the government’s own internal records. Several credible newspapers like Hindustan Times which have covered this subject have reported a 50% decline in the sale of medicines in the private chemist shops because of medicines availability in government hospitals. Live Mint has done a full coverage of Mohalla Clinics started by Delhi government. 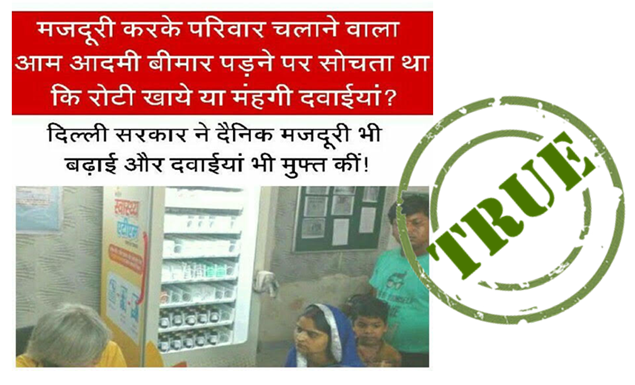 The coverage has reinforced the claim of availability of medicines. Government’s outcome based budget 2017-18 document reflects that the lead time for replenishment of any drugs or medicine in case of non-availability is 1-day. Delhi Government had launched an app and a helpline using which the patients can message the names of medicines that they are unable to procure from government hospitals. The claim about medicine availability, therefore, has been found to be true. 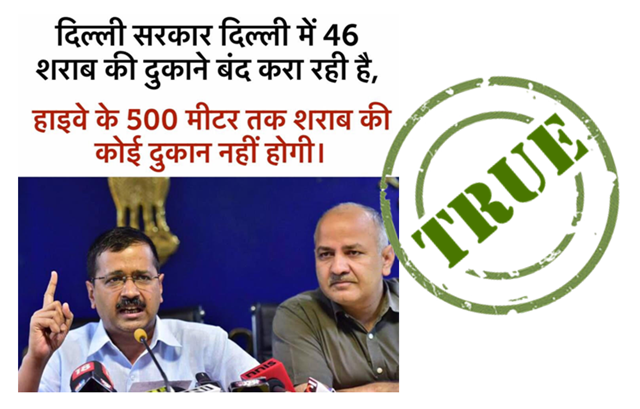 Claim #5: Delhi government shutting down 46 liquor shops. No such shops to be allowed in within 500 metres range of highway. In compliance with Supreme Court judgment to shut down all the liquor shops within the 500 metre range of highways, Delhi government conducted a survey and found that 46 liquor shops were operational in violation of the court judgment and hence is in process of shutting them. However, no government order could be found on the Delhi Government website. What is the claim of any politician or government that you would like us to Fact Check? Write to JoinUs@electionpromisestracker.in and we would attempt to present the complete, unbiased and meaningful truth about the claim! We make every effort to ensure that our fact-checks present accurate, latest and the most relevant information. However, in case you find any discrepancy in our data, please write to us at Anuragkundu@electionpromisestracker.in and we promise to address it immediately with due acknowledgement to the individual who corrects.